A beautiful stand of beech trees are planted just inside the forest gates near the train station. The beech tree has a silvery grey bark and can grow up to 40 metres in height. 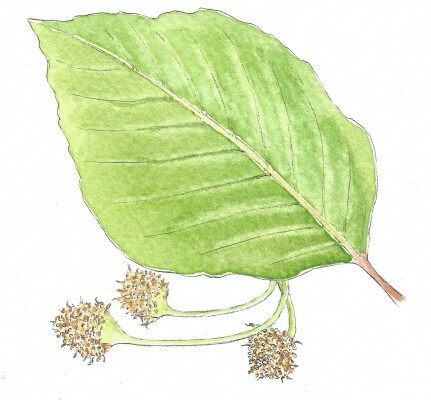 In the spring time, the leaf buds open to show almost luminous yellow green leaves. These leaves darken as the year progresses before slowly turning from orange to brown in autumn time. The fruits (nuts) of a beech tree occur as paired nuts that are surrounded by a spiny brown husk. This casing splits into four parts to release the nuts. Every couple of years there is a ‘mast year’ in which a bumper crop of nuts are produced. In winter, the buds are reminiscent of a slender cigar.